One of the more destructive traits of Malaysia society today is academic dishonesty.it runs throughout many facets of society. Academic dishonesty is not just an education issue, it’s also prevalent within the civil service, business, and even political walks of life within society. A few high profile cases of academic dishonesty have arisen over the last few years. Two Federal deputy Ministers, Richard Riot (Human Resources) and Dr Ewon Ebin (Science) were found to have fake degrees a couple of years ago. An executive director of a private college of higher education affiliated with a UK university, and pop star Fazley Yaakob was found to hold two fake degrees, and two public company directors were also found to have fake degrees. Many prominent figures in Malaysian society have bought ‘bogus degrees’ from unaccredited universities to enhance their qualifications and CVs. There are also cases of Malaysians trying to use fake degrees to get work overseas in countries like New Zealand. However, this lack of academic integrity is not limited to acquiring fake degrees. A prominent academic has developed a collection of awards that could be considered dubious. Awards such as the Socrates Award in Education, Best Manager Award, and ‘The Name in Science’ awarded by “a designer award mill” called the Europe Business Assembly (EBA), purportedly located in Oxford, UK, appear to grant awards on application and payment, rather than being scrutinized by any international panel. Other such dubious awards include the “Merit of Commandeur” conferred by an organization called the Belgian Chamber of Inventors (BCI), of which any trace cannot be found through internet searches. This is not the first time such awards have been previously controversial in Malaysia and the region. There have been numerous issues in regards to plagiarism. Back in 2013, an Utusan Malaysia writer Ridhuan Tee was accused of plagiarism by a Universiti Teknologi Malaysia lecturer Dr Aril Yasreen Mohd. Yassin. Although the matter was never resolved, Ridhuan Tee was appointed an associate professor at Universiti Pertahanan Nasional Malaysia (National Defence University). Plagiarism in the copying of internet, book, and article material for publications is wide spread within Malaysia, although, very few reports ever rise to the public domain. Adeline Lee Zhia Ern, a Malaysian writer was caught plagiarizing Jack Canfield’s Chicken Soup for the Soil IV in her first book Lethal Lesson and Other Stories, where her book was withdrawn from the market and destroyed. An editor working for the New Straits Times, Brendan Pereira was dismissed because of plagiarizing the work of US journalist Mitch Albom. Last year, the Malaysian national news agency Bernama suspended a journalist for plagiarizing an article from the Jakarta Post. Plagiarism is not just confined to books. Australian Masterchef finalist Alvin Quah was accused of plagiarism by Rasa Malaysia’s Bee Yin Low from the Asian food blog Rasa Malaysia. With the level of academic dishonesty in general society, it’s not surprising that there is a lack of academic integrity within Malaysian institutions of higher education. However what is surprising is the extent of it, particularly among students according to a recent survey. These practices are not just restricted to students. A startling but not well publicized piece of research on student academic dishonesty in Malaysia showed academic dishonesty is rampant. It was revealed that students well understand what university policies are towards plagiarism and cheating are. Yet due to peer pressure and the feeling of security of collective culture, large percentages of students partake in cheating in one or another form. The study went on to state that 95.7% of students had partaken in some form of plagiarism, 96% had shared an assignment with other students, 93% had cheated during tests, 92% had falsified data, 86% had cheated in exams, and 90% had copied a friends assignment. Due to the sheer number of students at Malaysian universities today, it is almost impossible to use tools like ‘turnitin’ to check all students work for plagiarism. In addition universities are worried about their reputations if pass rates are poor, and often put extreme pressure on lecturers to pass students. Failing a student in some faculties within a Malaysian university would just lead to a long serious of meetings and extra work to reassess and pass someone them, many lecturers have told the writer. Unfortunately, some staff at Malaysian universities are not good role models to students. In one of the few cases that came to public attention was two Universiti Putra Malaysia (UPM) lecturers who were caught plagiarizing materials from the internet to produce an effective writing handbook. The action taken against the authors was only a reprimand. A similar case involving a deputy vice chancellor of another university was ‘pushed under the rug’. However the IEEE banned any papers from the academic in any of their journals for 10 years. Some lecturers use undergraduate student assignments as the basis of papers they publish in academic journals. This accounts for the large number of papers some lecturers are able to produce each year. Student names are rarely added as authors to the lecturer’s submissions to journals. A number of deans and high office bearers within Malaysian universities specifically hire staff from countries like Bangladesh to be a ghost writer for them. These staff members have no other duties other than to produce papers and even books for their employers. This is in addition to lecturers also putting their superiors name on their papers to carry favour. Some staff members have also been known to employ a ghost writer to research and write their PhD thesis. Plagiarism is extremely high among lecturers and professors within Malaysian universities, and only occasionally will any academic come out and publically talk about what is going on. 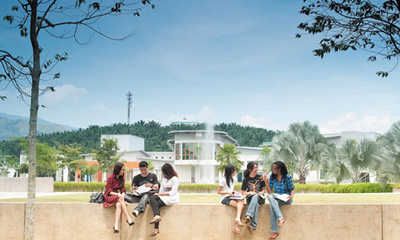 With the push over the last few years for Malaysian universities to rise in the world rankings, publishing has become a very important issue for academics. Universities have put a lot of funds into improving their volume of articles published in academic journals. Many methods are being used to get articles published and gain citations for their work. Many Malaysian academics are using the ‘checkbook’ to just pay for publication. A number of academic journals are now springing up using a ‘pay to publish’ approach, rather than the ‘double blind referee’ approach, traditional to academic publishing in the past. Lecturers also give papers at conferences where proceedings are published in journals after the conference. If one goes to Google Scholar and checks the publication citations of some of the new universities, it will become very evident that many academics are gaining large numbers of citations for their work within very short periods of time. This has been particularly the case over the last three to four years. High numbers of citations are being generated through the sheer volume of papers where lecturers cite their own work, and make agreements with other lecturers to cross-cite each other’s work. Unfortunately some international universities are cashing in on the Malaysian Ministry of Education’s quest to improve qualifications among public university lecturers. Many Malaysian lecturers are sent to overseas universities which guarantee a pass to gain their PhD. There is currently a very low state of academic integrity within Malaysian universities today. However universities are only a microcosm of the general society around them. Fraudulent academic practices and dishonesty is almost an acceptable behaviour today in Malaysia, as the national and institutional leaders have done very little to highlight the seriousness of these offences. Academically dishonest people are leniently dealt with in Malaysia, which has given today’s younger generation ‘skewed ideas’ about morality and ethics. Academic dishonesty is a destructive modus operandi which is running freely in Malaysia today. The prevalence of academic dishonesty shows that moral and ethical standards are slipping in Malaysia, where a whole new generation is being told that it’s OK to steal the creative work and ideas of others. There is a very high tolerance in Malaysian society for fraud, cheating and mediocrity. This also partly explains why the prime minister of Malaysia Abdul Najib Razak can survive the current 1MDB scandal. Malaysians have become ‘seasoned’ to deceit, lies, and corruption. Malaysia is now a country where some ministers don’t know their own portfolios, students don’t know their career disciplines, and university professors who just don’t know their fields. This is costing Malaysian society greatly. Mediocrity rather than meritocracy is favoured, which will affect Malaysia’s human capital competitiveness in the coming years. This is a problem that is coming from the top of Malaysia’s institutions, where reform is desperately needed.